Toronto is a melting pot of cultures. Turn this way, see Greece, Italy, France, that way, China, Portugal, Taiwan, you name it. Through the diversity of this municipality comes culturally crafted cuisine. Cravings can easily be catered to in this city, though; the copiousness of choices might complicate choosing a place to feast. There are countless fine dining establishments scattered throughout this town. However, they may not always be accessible to the economically conscious, which is why Summerlicious exists. This annual food festival is celebrating its 10th year this July from the 6th-22nd and over 100 restaurants will be participating. During Summerlicious, Toronto’s Top restaurants offer prix fixe menus with starters, entrées and desserts. Vegetarian menus are also available. The prices during the food festival range from $15, $20 or $30 for lunch and $25, $35 or $45 for dinner (drinks and tip are extra). *Fair warning: portion sizes reflect the reduced prices; don’t expect to get a 40 oz. steak dinner for $20. Initially, the promotion began with 35 participating restaurants in 2003. Constructed on comparable events in other cities, it was intended to increase the restaurant business at a slow stage of the year. The festival is managed by the special events department of the city; they elect which establishments are permitted to partake. Numerous rubrics for suitable restaurants include firm price standards, a clean health inspection record, and good reviews from prominent Toronto restaurant review guides. Substandard eating places or franchised chains do not contribute to this event. The hottest season of the year has become synonymous with Summerlicious. Once the shorts, tank tops and flip flops come out, everyone knows the event is on its way. This two week festival of food floods the city, carrying people who wouldn’t otherwise visit most eateries, straight to the doorstep of these establishments. Summerlicious is their chance to experience the chefs’ cleverness, while absorbing the ambiance of these restaurants. So, whether you enjoy sampling new foods, or are afraid of taking risks with restaurants, Summerlicious is suitable for all. $15 isn’t a steep price to pay for lunch, so why not be part of a Toronto tradition? Residents and visitors alike adore the opportunity to awaken their appetite with an inexpensive amount of cash. 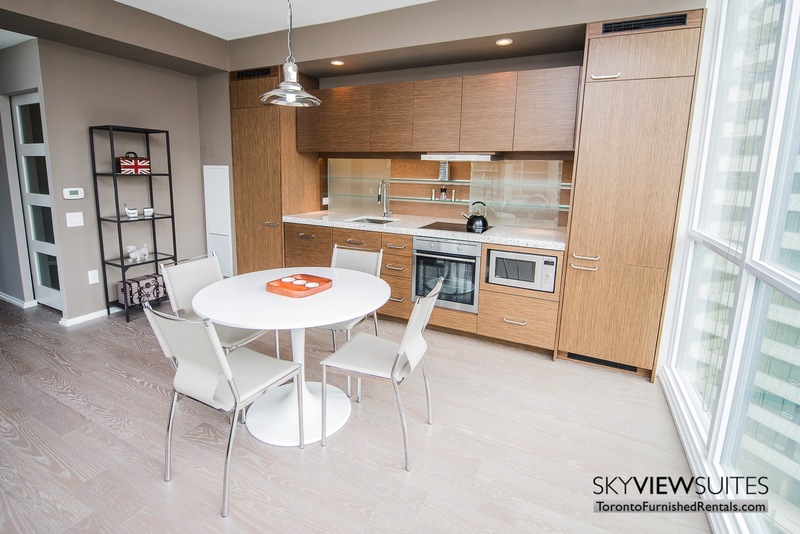 Foodies flying out for this feast find furnished condo rentals in Toronto comfortable and affordable. Toronto accommodations can be made by calling 1-888-SVS-STAY (787-7829).